The suitcases and the bat bag are all packed and waiting to go to Spring Training! At least, I think I’ve packed everything. Of course, when you turn a certain age–I’ll be 55 tomorrow–the most important thing to pack is all your pills. I’ve packed all the underwear that I own and I’m still short a pair or two of shorts. That’s the kind of thing however, that makes a trip adventurous! . . . Hmmm, I must be getting old if I think that running out of underwear qualifies as an adventure. . . . Well, in any case, I’m sure we’ll have more exciting adventures than that while in Florida. We’ll tweet every day (@AustinGisriel) and I’ll do my best to post something to this blog every night. 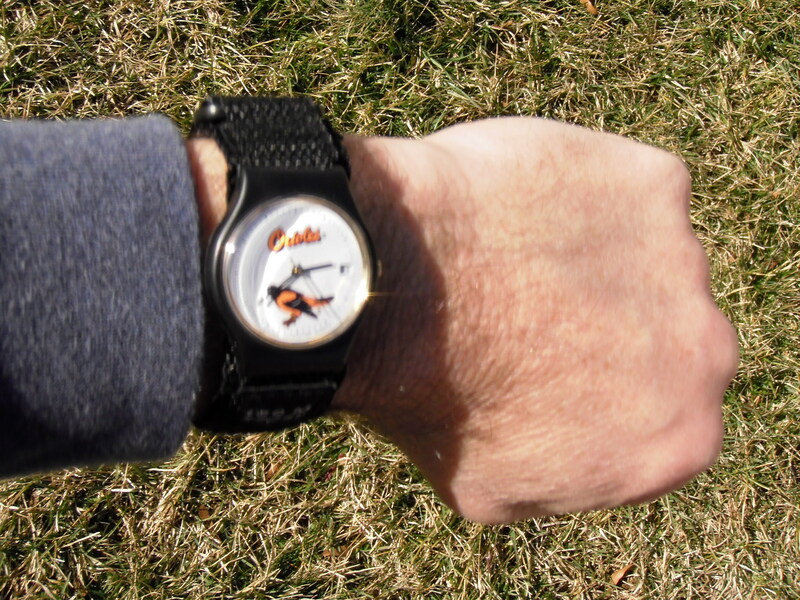 The official time will be kept on my official Oriole watch, so that you will know right down to the minute when our adventures occur, including the Wal-Mart run when we’re out of clean underwear. This entry was posted in Spring Training Trip 2012 and tagged Florida, official time, Orioles, spring training, underwear, Wal-Mart. Bookmark the permalink. Oh man… wish I was going with you, and in fact, you should probably check the trunk to make sure I’m not there. Have a great trip…one can sense the enthusiasm in your written words. I was in Florida last Spring and it was a lot of fun. If you catch a Phillies game, Sam Perlozo is a great guy, and he and his brother Nick played in the VBL. If you get a chance to see Sam tell him that I said hello. It has been a lot of years, but he should remember me…as much baseball as we talked during the games and in the Elbow Room in Harrisonburg. Thanks for the kind words and the tips on who to look out for! Of course you will be going to Sarasota, but what other parks will you be going to? Though I live fairly close to the Blue Jays park in Dunedin, I’ve never made it. I plan to go this year though. Have a safe trip. We’re going to a Pirates game on Sunday and have plans to see a USF game. Have tentative plans to see Detroit in Lakeland and check on a couple of Atlanta minor leaguers whom we know. *Stewart. Gee, I am in my 50s, but you’d think I would know how to spell my name! Hey, maybe you’re starting to forget! I turned 55 yesterday so I know!